There is some confusion regarding Lucy Azarian's names, both first and last. Her first name is listed in various records as: Egisabet (Elizabeth), Lucy, Louisa, and Lotizika. Family traditions suggest that her maiden name was either Hagopian or Arevian. 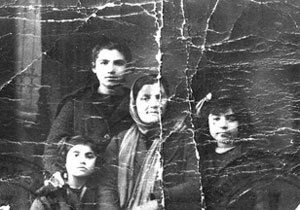 Unfortunately, the records of her marriage and the baptisms of her children in the Armenian Catholic Church in Istanbul only add confusion to the discrepancy. 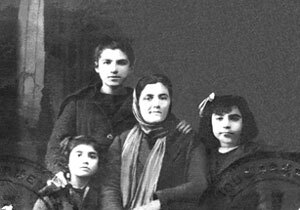 According to a compilation of records Lucy Hagopian was born on January 15, 1875/76 in Perkinik, Turkey the daughter of Hagop and Annik Hagopian. Her siblings were Hagop, Baptist, Hovaness, Christine, and Nazareth. The information on Lucy's date of birth was taken from her immigration information and her death record. 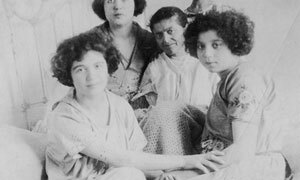 The information on the place of Lucy's birth is taken from family history and the information she supplied at the time of her immigration to the United States in 1921. Her mother's name was taken from family information. Her father's name was taken from family information and the marriage record of Lucy and Abraham. The marriage record listed Lucy's maiden name as Hagopian. The baptismal records of her children listed her six times as Hagopian and two times as Arevian. See Children of Abram and Lucy Azarian under Abram. 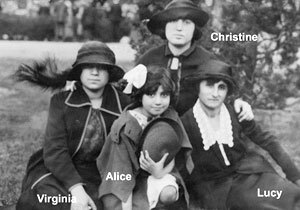 At the marriage of her daughters, Christine in 1929 and Alice in 1941, her maiden name was given as Arevian. Lucille Iorio Gaudelli told me on August 12, 2000 that her mother said that Lucy Arevian was an orphan. If this was true, it could account for some of the confusion about her name. It is possible that her father died and her mother remarried. In this scenario, I would suggest that her father's surname was Hagopian and after his death her mother married an Arevian. This would allow for the use of both names and would allow a connection to full siblings named Hagopian and half siblings named Arevian. This is a theory. The information on Lucy's death certificate listed her parents as Melcon and Catherine Agopian. This information was provided by Abraham and was clearly in error. Lucy and Abram's son, Mike Azarian, provided the same names "Melcon Azarian and Catherine Hagopian" as Abram's parents names on his death certificate. Undoubtedly, Lucy and/or Abraham had associations with both the Hagopian and Arevian families as baptismal sponsors of their children include both Hagopians and Arevians. The immigration information for both Melcon Azarian in 1920 and Lucy Azarian in 1921 listed Batist Arevian as the next of kin in Turkey. 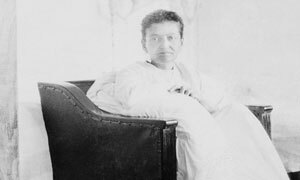 At the time of his immigration in 1920, Lucy's son, Melcon, listed "Baptist" Arevian as his "cousin". 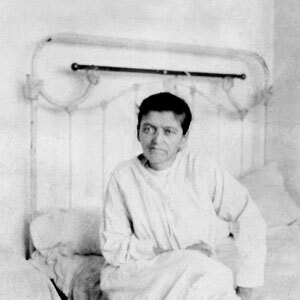 A year later at the time of her own immigration, Lucy listed "Patiste" Arevian as a "brother-in-law". If Batist/Patiste was two different people he could have been Melcon's cousin and Lucy's brother-in-law. However, it is more likely that "Baptist" and "Patiste" were one and the same person. The true relationship of Melcon and Lucy to Baptist/Patiste is unknown. Immigration information for Abraham Azarian and Mike Azarian used the same confusing term "brother-in-law" in cases where it clearly did not apply. See the immigration information on Abraham and Mike. In Armenia, A Historical Atlas, by Robert H Hewsen, published in 2001, Pirkenik (Prkink) is shown on the map of villayet of Sivas as a village just north of the town of Sivas (Sebastia). Hewsen says, and that "The village of Perkinik, one hour from Sivas, was a Roman Catholic Center". Tom and I visited Perkinik in May 2008. For information on Perkinik and for images of the village go to Perkinik now or at the bottom of the page. See Abram Azarian for more information on the marriage. 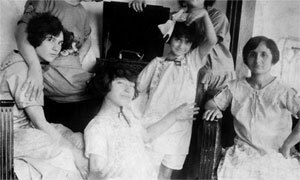 Lotzika Azarian, a 45-year-old female, "housekeeper" (This was the common indication for house wife), and her daughters, Annik, age 12, pupil, Heghine, age 7, pupil, and Zabel, age 5, nil (meaning no occupation), arrived on May 15, 1921 on the S.S. Calabria from Patras, Greece. The Calabria had sailed from Patras on April 24th, a twenty-day voyage. Lotzika was listed as able to read but not write Armenian. Annik and Heghine were listed as able to read and write Armenian and Zabel was listed as not able to do either. Lotzika listed her next of kin in Turkey as her "brother-in-law" Patiste Arevian of Constantinople. She was listed as having paid the passage for herself and her daughters. Her relative in the US was her husband, Apram Azarian, at 305 E. 21st St. New York. There was a notation "spec med" for Lotzika and Zabel. Lotzika was described as 5ft. 1in. tall, dark, complexion, black hair and brown eyes, in good health, place of birth, Pirkenik, Turkey. Annik was described as 5 ft tall, dark complexion, black hair, brown eyes, in good health, born in Sevastia. Heghine was described a 4 ft tall, dark complexion, black hair, brown eyes, in good health, born in Sevastia. Zabel was not given a height; she was described as dark complexion, black hair, brown eyes, in good health, born in Sevastia. There were 786 passengers on the Calabria, 537 of them in steerage. Lotzika Azarian and 3 children are listed as detained aliens in the record of detained aliens at the end of the manifest. Theye were designated: group 10, number 4. The cause of detention is listed as "to call". US immigration laws prohibited women and children who were not accompanied by male relatives from entering the country. Unescorted females where detained until a spouse, father, or male family member came to retrieve them. If no one came to "call" for them they were deported back to the country of origin. According to the Record of Detained Aliens of the S.S. Calabria, Lotizika and children were released on May 18th at 3:25 to their husband and father, Abraham, of 305 E. 21 St., New York. Basically they waited three days for Abram to come and get them. Several of the women on the detained aliens list with them were not "called for" until well into the first week of June. 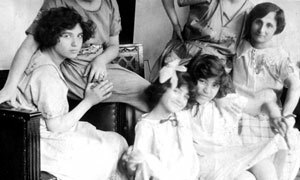 According to her death certificate, Lucy Azarian died of myocarditis and broncho-pneumonia on August 5, 1923 at 7 A. M at 183 Clinton Avenue, West Hoboken (now Union City). She had been seen by the doctor from July 26. A contributory cause of death was articular rheumatism, with a duration of 4 years. Personal statistics were given by her husband, Apraham Azarian. It lists her age as 48, her date of birth as January 15, 1875 in Armenia, her father was Melcon and her mother was Catherine Agopian, her last address was 183 Clinton Avenue, West Hoboken. She was buried on August 7 in Grove Church Cemetery. Lucy Azarian's death certificate is available on microfilm in the New Jersey State Archives in Trenton, New Jersey. Family history say she had cancer, but there is no indication of this on her death record. See Abraham Azarian for an image of the grave site.